Crease the sheet up to the maximum width of .25 or .50 inch. The sheet is for 8.5 x 11-inch letter portrait hard covers. More sizes will be available soon. Now, any print shop with a perfect binder can add value-added hard cover finishing and tap into the fastest growing trend in the short and medium run. The Casing-In Sheet™ produces a free-floating spine for a flatter opening of the pages and stronger durability of your finished book. 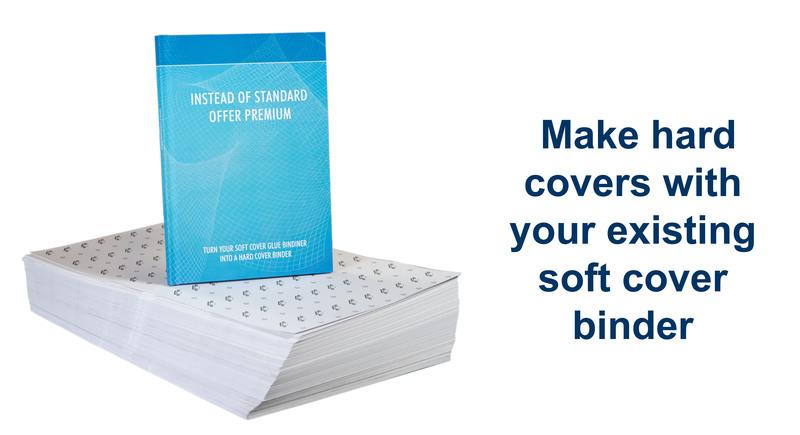 You can use any cover on the market, either standard or custom printed hard covers. You can also make a hybrid semi hard soft cover, for a thicker feel, increased binding strength and a free-floating spine. The Fastbind Casing-In Sheet™ is very different from a standard endpaper: It is in between the end sheet and the cover, never to be seen. iard cover books. 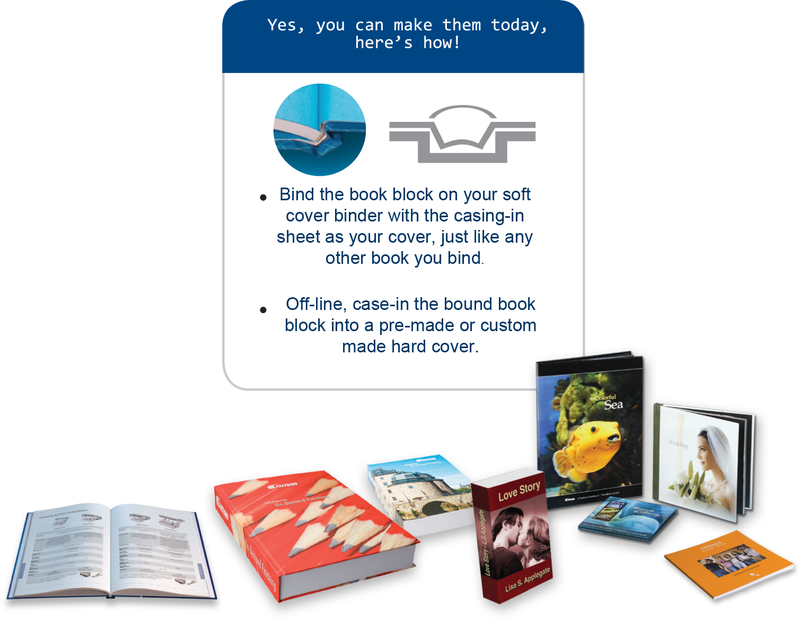 The Casing-In Sheet enables you to easily make profitable hard cover books. The New Casing-In Sheet supports various thicknesses and there is no change to your standard binding operation. You can make both types of books on the fly, with out changing your standard process. machines with auto feeding and complete automation to the most manual ones, including our entry level Fastbind Secura. It works with both EVA and PUR binders, as any soft cover would. Until now, casing-in required several pieces of expensive and large equipment and a significant investment. That is not the case anymore. With just this special patented sheet, you can bind a soft cover , which is now ready made to case-in into a hard cover! Now, any print shop with a perfect binder can add value-added hard cover finishing and tap into the fastest growing trend in the short and medium run. The Casing-In Sheet produces a free-floating spine for a more flat opening of the pages and stronger durability of your finished book.You can use any cover on the market, either standard or custom printed hard covers. You can also make a hybrid semi hard soft cover, for a thicker feel, increased binding strength and a free floating spine. The end paper of your book (front and back ) can be colored, printed or even laminated. No special machines are required. However, we highly recommend the use of the compact Fastbind Presso (casing-in and groove press machine) for a perfect finished product.